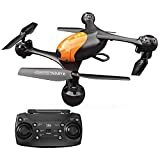 Best octocopter drones for sale reviews 2019 – find out which octocopter drones are best to buy. Popular brands of octocopter drones are reviewed in this article. Drones have been soaring high in the market for many years. People are buying them for both personal recreation and professional applications. The trend has yet to slow down. In fact, sales are likely to grow in the near future thanks to interesting innovations. Massive demand has led to accelerated technological developments in this product category. The latest designs have better performance and greater reliability. New sub-categories have even emerged in an attempt to solve old problems and provide consumers with more options. Octocopter drones are excellent examples. Here we discuss them in detail and share some of the best products available right now. What is an Octocopter Drone? The Tarot x8 Comes with Metal GPS Mount. It is Plug Type, Easy to Folding. There is Air Deflector Groove On top; It Could Bring Good Heat Dissipation Effect. Shoppers who are looking for a light and portable solution should give this a chance. The best thing about this model is how minimalist it is. Anything that is not completely necessary has been shaved off, resulting in a total weight of just 2.5kg. They even found a way to make it incredibly compact during travel: folding the frame like an umbrella to reduce the footprint. Even the landing gear is electronically retractable. This may not be the most attractive drone out there but it gets the job done. Users can enjoy reasonable flight times. Heat dissipation is excellent which bodes well for its longevity. There is also a GPS mount in case owners want to extend its capacities. It can carry around 10 kg of load which means adding a pro camera is possible. Last but not the least, it is one of the most affordable high quality octocopters in the market. 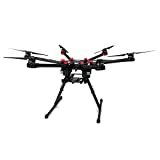 If you have a bit more cash to spare, then take a look at the DJI S1000. This is popular amount photographers and videographers. The stability, power, and efficiency are top notch. It can even fly as fast as 45mph so you should be able to follow moving subjects with ease. The arms can also be folded like in the Tarot X8 for ease of travel and storage. The drone itself weighs 4kg but it can carry up to 11kg if you want it to. Most will probably use this as an opportunity to attach a pro-level DSLR. There is a low-mounted gimbal so expect to get clear shots from all angles. DJI also placed dampers to reduce vibrations and help produce sharper footage. This small drone has a versatile frame that can be configured to use different numbers of motors and propellers. It works well as an octocopter with good stability and portability. It may not be as powerful as the previous models mentioned but it can still carry a GoPro camera or a small DSLR. It is suitable for filmmakers who make a living traveling to different locations all the time. Carrying this will not hurt their back at just 1.5kg. It is a ready-to-fly octocopter with a 3-axis brushless gimbal and an anti-vibration system to ensure professional footage. In a nutshell, octocopters have eight motors and propellers to lift the unit off the ground – much more than the typical drone. It is not just a gimmick because the added appendages give them real advantages over others. 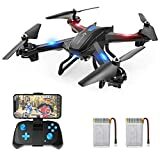 Quadcopters with four propellers are currently the most popular type. Although they are likely to stay on top in the near future, octocopters are sure to turn heads and get their fair share of the market. Quadcopters are popular because they offer excellent maneuverability. It is a joy to pilot these small unmanned aerial vehicles. Even beginners should be able to learn how to use them quickly. They have better thrust compared to those with a lower number of propellers. They can also carry a good amount of payload which could include batteries and cameras. In addition, these are relatively affordable so enthusiasts love them. The design has been around for a while and has proven to be a winner. Octocopters, on the other hand, are a more recent phenomenon. They use more components compared to quadcopters so it should not be a surprise that they are heavier. They fetch a higher price as well. However, these do not deter dedicated drone users from buying them. The increased speed, agility, power, and reliability makes it all worthwhile. These units are also able to go up higher while remaining steady despite challenging weather conditions. Drones can cost a significant amount of money. Buyers should invest in gear that will last for a long time despite the challenges. Remember that these may be knocked about by the wind and fall from a great height. Those of poor quality may suffer from major damage quite easily and become unusable. The shell might crack, the propellers might snap, and the cameras may fail. The units will also experience bumps and bruises during travel. Make sure that you are getting something that that has solid build quality for your peace of mind. Many drone users will want to take their unit to scenic spots for flying and filming. For example, a lot of people take theirs on vacations to beaches all over the world. It allows them to take incredible footage of the coastline that make their friends green with envy. Others simply need to take their equipment wherever their job requires them to be. Therefore, portability is a big concern. A relatively lightweight unit would be ideal. Of course, you should have a different standard with octocopter drones since these tend to be heavier than quadcopters. Footprint should also be considered. Some models can be made more compact for travel. One of the biggest reasons why someone might prefer purchasing an octocopter instead of a quadcopter is the payload capacity. More motors means more power and thus a higher carrying capacity. High quality cameras tend to be large and heavy. You will need a drone that can haul them without breaking a sweat. The heavier the camera, the larger the octocopter should be so as not to compromise performance. If you are going to take videos using your drone, then you presumably want the footage to be smooth and steady. The unit should thus be able to fly that way to achieve the desired results. Check out reviews and watch videos of various models in action to see how well they fly. 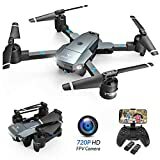 You should also make sure that it has a 3-axis gimbal that can further stabilize the camera while the drone flies about. If you are racing, then you will also want something that is fast and powerful. You can only pilot the drone while it is within the range of the remote control. The bigger the range, the farther you can go while staying in one spot. If you are simply trying to film around your home, then a range of 50-100 meters might be more than enough. If you are aiming for epic shots of a beautiful landscape, then you will need a lot more or else you risk losing your equipment. Some models are capable of maintaining a connection within a few kilometers. In some units, you can use your own transmitter so just configure it to your desired specifications. Consider how long you need to be up in the air. Octocopters are notorious for having short flight times. Their batteries need to power eight different motors at the same time so consumption is quite high. A few minutes is all that might get per charge. If this seems too limiting, then just buy several spare batteries that you can swap. You will be ready to go again in no time at all. Batteries are not cheap but this is the easiest solution to the problem. 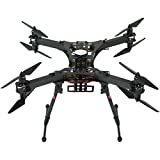 An alternative is to find a fairly light or low-power octocopter that can provide longer than average flight time. Buying a drone is only the beginning. After a while, you might find yourself needing to purchase spare parts to fix problems. For example, one of the propellers might be broken or a motor might have stopped working. Getting spare parts is certainly cheaper than giving up on the unit and buying a completely new drone. Make sure that you have a unit with widely available parts. Think ahead. Otherwise, you might find yourself dealing with an expensive problem down the road. Most drone manufacturers are focusing on quadcopters since that is what the majority of consumers are buying right now. Only a few have the capacity and the vision to push the boundaries by bringing octocopters to the market at this moment. DJI, Tarot, and xFold are among the names to take note of in this category. They have already proven their worth on other segments and are now bringing their considerable expertise into this new frontier. There is a wide variation pricing among octocopters. Some can be acquired for a few hundred dollars while others will set you back by several thousands of dollars. Think carefully about what you want to achieve. Ask yourself how much you can afford to spend. Octocopters bring a higher level of stability and reliability in the world of drones. Pros and hobbyists alike are embracing this category. Try them out to add a new dimension to your videography. Compare different models and purchase that the one that best suits your needs.